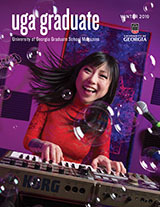 The University of Georgia Integrated Life Sciences (ILS) Program offers graduate students pursuing a doctoral degree opportunities to explore different areas of life sciences research before selecting a home department and research focus. A hallmark of this competitive UGA graduate program is its emphasis on interdisciplinary research by faculty and students. During their first year ILS graduate students engage in a curriculum focused on research and professional development, and perform three in-depth research rotations in the labs of faculty from any of the participating departments. By the end of the fall semester, ILS students are expected to join a sponsoring faculty advisor/lab and enter an appropriate graduate program. After this point, students will be required to meet all the doctoral degree requirements in that department. The ILS portal is designed to broaden research opportunities for students who wish to explore the breadth and depth of research in the life sciences.